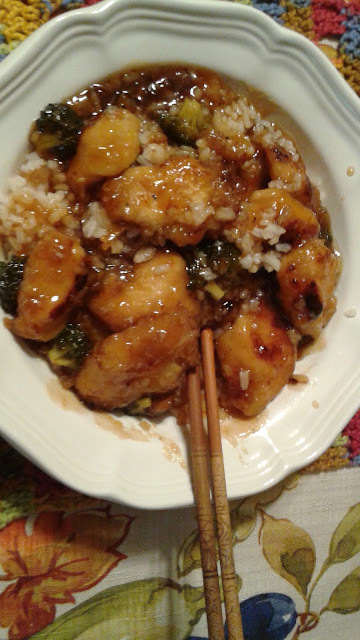 This is orange cashew chicken that we eat often around here... I basically use this orange chicken recipe and tweak it for my diet. I sub coconut aminos for the soy sauce and I use tapioca starch instead of cornstarch. I will often leave out the sesame seeds and add raw cashews to saute with the chicken once it is browned. I add the cashews before the sauce. I also add honey instead of brown sugar most of the time, too. This is a very flexible recipe and you can add or leave out any of the spicy ingredients to get the heat or lack of heat you prefer. I serve it over rice and add a vegetable or blend of veggies that I can stir fry to go with it. I have taken to making my own "takeout" so I can control what goes into it. Showing off a new tablecloth I picked up at Walmart and a table runner I crocheted that I shared the other day with you guys. This was inspired and very close to the recipe found at Julia's Album website. It was very Autumn festive and delicious! I think this is going to happen again for Thanksgiving. My hubby is the grillmaster so I took photos of these delicious pork chops he grilled. I marinated them in a balsamic honey vinaigrette I made. I will do a post on vinaigrettes sometime for you. 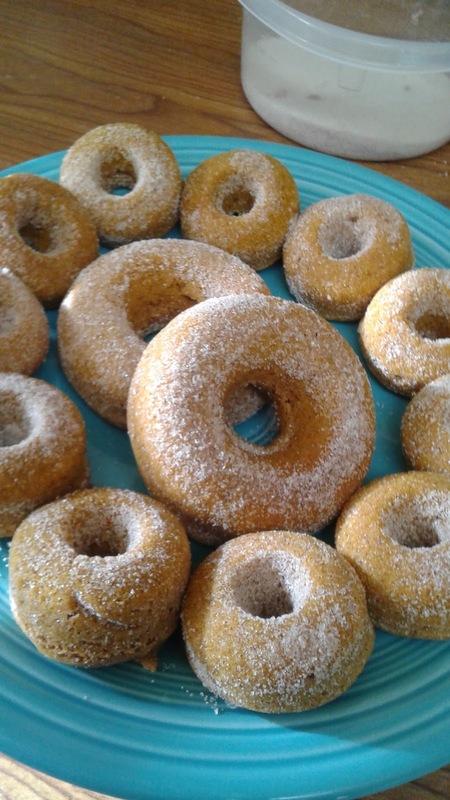 I made these gluten free pumpkin donuts for us for a Saturday morning breakfast not too long ago. The recipe is not mine... I got it here at Food By Teva (and yes, I used her version so I could use the Bob's Red Mill Gluten free 1to1 Flour) No one missed the gluten and they did not last long! 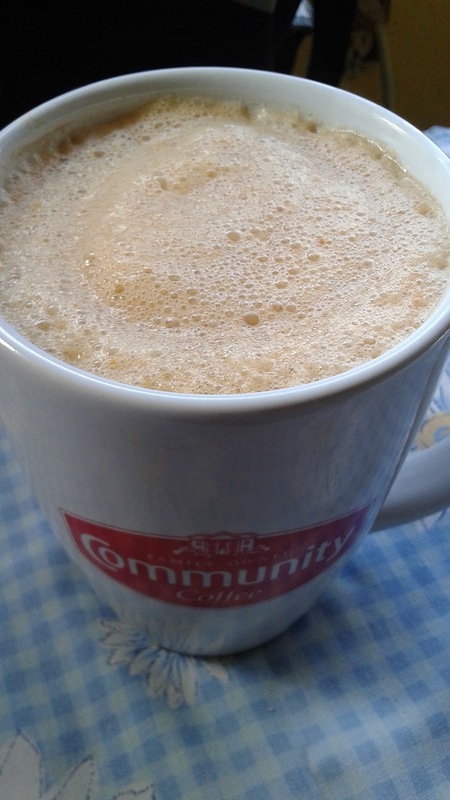 I tweaked this to fit my diet but here is my homemade Pumpkin Spice Latte inspired by this site's chart. I used almond milk and I have also used cashew milk and left out the cocoa from this one above. I am super crazy good at shipping almond and cashew milk into a froth but you need to warm the milk slightly and use a good whisk. Coconut milk does really well, too. This might be one of my favorite things in the world. 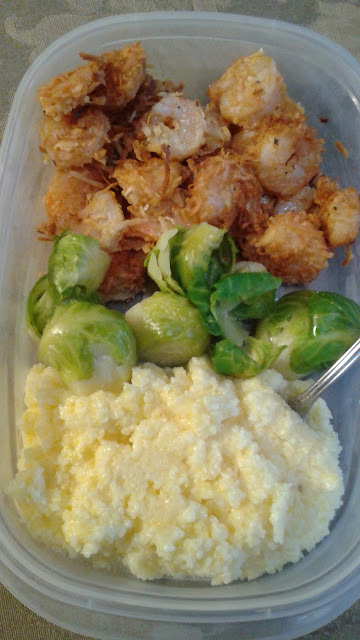 I made some Paleo Coconut Shrimp, grits and Brussel sprouts on a weekend when I was home all day Saturday by myself. I was playing with food and this just happened! LOL Coconut shrimp is AMAZING and even more so with grits! Another "takeout" dish I make regularly.... sweet and sour chicken over rice. You can probably see little bits of broccoli in there, too. I love a one bowl meal! 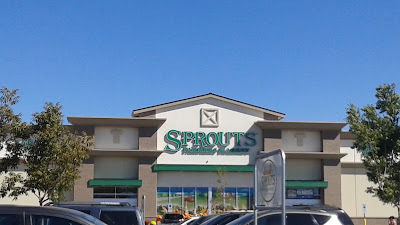 Made a stop this past weekend at my favorite grocery market called Sprouts (yes, even more so than Whole Foods because until the grand opening tomorrow that is all we had in the "health food" realm of full markets) I had a special helper with me. We just recently got one on the east side of town. There is one on the west side, too. I had not visited the east side one until this past weekend. Their produce is beautiful and always reasonably priced compared to just about everyone in town. So, there are some highlights from my October cooking adventures. What are you up to in the kitchen this month? Do you have any special things you like to make in October? 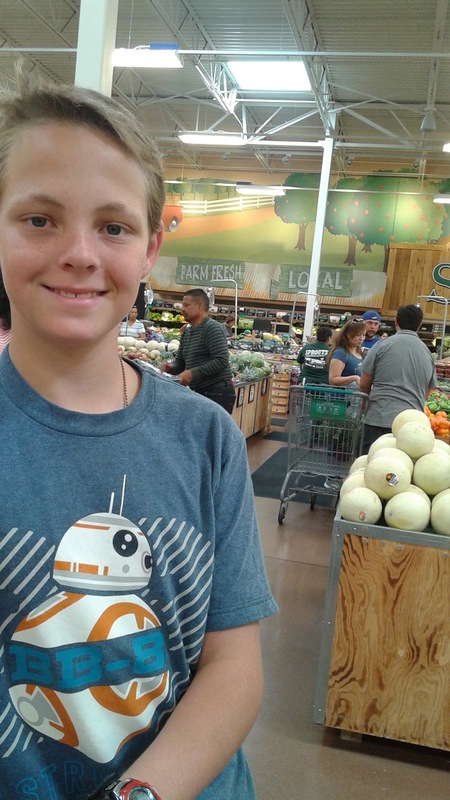 Do you have a favorite place to shop for foodie stuff? I'm still eating away on that spaghetti squash/mushroom tetrazinni. Realized I need to not just inventory the freezer, but start really eating out of it. I was digging in the "fish" section (lower shelf, right side in back), only to find I'd been tucking other stuff in that area because there was room. So lamb chops it is for dinner tonight, rather than salmon! Seriously love lamb almost better than a good steak. It's a rare treat, though. I have some ground lamb in my freezer right now that were bought to make meatballs. I am glad you mentioned lamb. I am pulling that out to make meatballs this weekend. It is a rare treat... I happened to get this on sale or I might not have bought it. I have been clearing out my freezer to make room for new turkeys and maybe a duck soon with the holidays coming. I find all kinds of crazy stuff I forgot I had when I do that. I also store a lot of things like rice and certain grains in there to fight weevils. Weevils are a big thing here. I really need to do a full defrost soon, too.